The discipline. You set it. You act on it. You let it become a habit. Even if it’s for an infinitesimal moment, the very act of doing that which you’ve promised yourself is significant. So forgive me today, for being unable to share something significant. But who said that sharing has to be only about things significant? Say for instance the nachos that I ate at the cinema today was good. That the film that I cried during some scenes in the movie. That I cry like a baby almost at the drop of a hat. That you probably have zero interest in learning about nachos and movies and mundane and banal stuff in my life, but point made. Coming back to the art of commitment. Once you’ve made it, it’s not for anyone that you need to sustain it, but for your own self. Because like self- love, if you don’t stay the course, can you expect anyone else to, or expect anyone else to believe that you can or will? So stay the course.mdont give up or give in. Act on your promises and don’t worry about the result. Am positive somewhere some door to and of possibilities will stare you in the face beckoning you to walk to the other side. Go discover. Remember “go there”? That is CNN’s tag-line. Today, it is “live the story” by BBC. They’re so connected to our lives isn’t it? If you don’t live the story, you can’t go there and if you can’t go there, you don’t live the story. the past, the future, the terror, the hurt, the angst, the regret, the guilt, the shame, the fear, the hesitancy, the reluctance, the “when I…” , the dreams, the missed opportunities, the “what if..”. Sigh! We never live the story of “now”. Never ever bother about what’s staring us in the face now. The wonderful work that you do now. The wonderful people you are surrounded by now. The family that loves you now. The comfort you have now. The world you have created around you now. The routine, the rituals, the experience, the expertise, everything that you have developed, and that is serving you now. Now, now, now. Why don’t we bother about now? Sigh! Maybe if we did, would we have stories to tell and live to tell the tale? But let’s make the “now” our story. Let’s make our present, our “right here”, in our “this very moment” count. Let’s not make up stories. Let’s live the story. I don’t know if you have ever suffered a meltdown. Well, if you haven’t, you’re a blessed soul, lucky really, and perhaps more mature, strong-willed and emotionally resilient than myself for sure (I can’t speak for the rest of the world). I hope you don’t ever have one. As you can see, it’s defined as a very fast loss of emotional self-control. Fast and loss are understatements. Unless you experience a meltdown it’d be difficult for you to imagine what it entails. All I can tell you is, I’m perhaps the queen-bee of meltdowns. It’s not a badge that I wear with pride, but I know what it means, and my heartfelt support to all those who do go through these. I know. I’ve been there and I continue to go there. Over the years what have all these meltdowns taught me? Meltdowns are difficult to articulate to anyone – it’s so difficult to say, “look I’m feeling lousy. I feel like I have no value and my life is a waste. I am so afraid, so so afraid and I feel like raving and ranting against my karma, my luck. I don’t know of what good my life is and why I was born. I can’t seem to make anything good to happen to me.” It’s not just bloody difficult to say, sometimes it can sound unconvincing to those who can’t for the life of them figure out why you have these episodes and what in the world is there to worry about??!! Slowly, painfully, tearfully, emotionally bruised and battered, as you make way to the light of normalcy, trying to shake off the shroud of pain, when your breathing is more rhythmic, when you can focus on squeezing your toes and stretching your feet and getting your mind off all these thoughts and emotions, you bury your head in shame and guilt. Wondering. What was I thinking?? You wait for your strength to come back. You wait for your brain to send those messages along your neural pathways to drum up the resolve of putting one foot in front of the other. You look up at the ceiling in your room and pray to the same God against whom you raved and ranted and kicked up a storm a few hours ago. You don’t want to look into His eyes. You don’t know how to say “sorry, please forgive me” to those you love without feeling miserable. You wait to feel life throb in your heart once again. You wait for “will” to kick in. The will to live, the will to dream, the will to “can do”. Then when your heart gets its ‘thump thump’ rhythm going, you start making the plans. You start discarding bad ideas. You start looking for the fight that lay buried somewhere in the far reaches of your soul. You start hoping. For the break of dawn. Of embracing a new day. Joyfully. Yes, meltdowns have a way of teaching us things about ourselves that we knew, but were too afraid to ask. Or too caught up in the facade of being super-beings – trying to ace everything, prove something, and finally being nothing. Ask me about meltdowns. I just had one. That fork in the road! 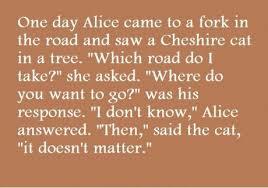 So what happens when you’re faced with the fork in the road? Like Yogi Berra says, take it. Yes, but which fork? And how will it shape your life? Will it be irrevocable or will you be able to retrace your steps? Will the woods be dark and deep with miles to go before you sleep or will the woods lead to a clearing with a house beckoning you to a world of imagined ‘bounties’ and what not? Sigh! I am faced with this dilemma now. I have been at the cusp of a new beginning in my professional life. On the verge of partnering with someone who I thought was excited by doing something that gave the both of us immense satisfaction and a high. Of delivering world class services at an affordable cost for those who were in need, in the area of communication design. But just when we were on the precipice of formalising it, there’s a twist. The partner/collaborator/ friend decides to pursue something else that has struck him as exciting and perhaps more up his alley in a manner of speaking. Wait. There’s another twist. This partner has invited some of his friends including myself to be a part of this new journey. And therein lies the fork in the road. And the questions that sometimes beget no black and white answers. a) Should one listen to one’s head or heart? b) Can one identify the voice of the Head and the Heart? c) Why is it bad to be rational and logical? Is it really that bad? And what’s so amazing about listening to the heart and intuition and instinct? d) Is going after “deemed” financial security bad? e) Can the excitement and the vision of being a leader replace being a mere follower? f) Can a follower be a small leader (small fish, big pond) and create followers and inspire within that limited sphere of influence? g) Is the sacrifice of charting your own path greater than plumping for financial security? h) Is financial security the only guarantee that one needs to work towards? i) Does success eventually mean a title, a designation, the bank account and the attendant experience that comes with it? j) Can one really go alone with one’s ideas and hope to God that He’s as kind as he was to Sarah Blakely? Of course when you read this, you realise she took a chance on herself and backed herself to the hilt. She was all that Life Coaches, spiritual leaders and Self-help 101 books tell you about – “keep the focus”, “visualise”, “believe in yourself and your dream”, “stay the course” and “fail” (and when you do, just get back up, dust off and begin again). k) Can one take a chance on oneself or shackle oneself down with imagined “fail” scenarios and fears? Is age really a factor? Or is it all about luck, timing and “never ever give up” attitude backed by some ingenious ideas? l) Should one settle for the heady risk or the risk headed by someone else where one has nothing to lose? m) Must one follow what others are doing or march to the beat of one’s own drum? n) Does listening to one’s heart always have you end up smiling at the end of the road with a hi-five? Or there are times when you rise with a heavy heart rueful of missed opportunities? o) What does it take to be that person who’s showing you the way and dangling the carrot? And causing the fork in the road? What carrot will I need to believe in myself? p) Is a leap of faith really so dangerous that a tumble will cause us to completely unravel? q) Is failure really such a vile, vicious, blood-sucking vampire? What’s to be afraid of? Dear God! I need a mentor, a clairvoyant, a crystal ball, a stiff drink and a dogged nose to be able to sniff out Truth vs. Rationale. I need to go where my heart has always longed to go. To do what I’ve longed to do. But I also need someone who believes in me more now than I do myself. I need an answer – what do I do? 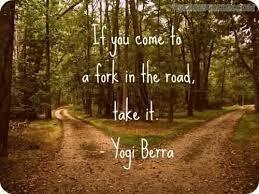 Well, Yogi Berra did say take the fork in the road. Sure Yogi. Which way?